To conduct market research for the party event and rental industry you will need to identify and analyze your competition. You can find local providers of these services through the internet or the yellow pages. The first step is to do some research on all of these companies. It is also a good idea to call them and request more information posing as a customer. If the competition has brochures or fliers they can send you, have them do so. This way you can easily determine what they are doing well and where their services may be lacking. Another step of market research is to determine if there is a need for your services in your geographic area. Try contacting some of your target audience (local schools, churches, fund-raising organizations, mothers’ groups…). You can contact this target audience by mailing or emailing a survey, or calling them directly. You will want to gather information about their past experiences with renting inflatables for events, future needs and any specifics that they may be able to share with. All of this research is time-consuming, but it will be critical to ensuring the success of your business.Strength, Weaknesses, and AttitudeYou will have to look at your strengths and weaknesses. 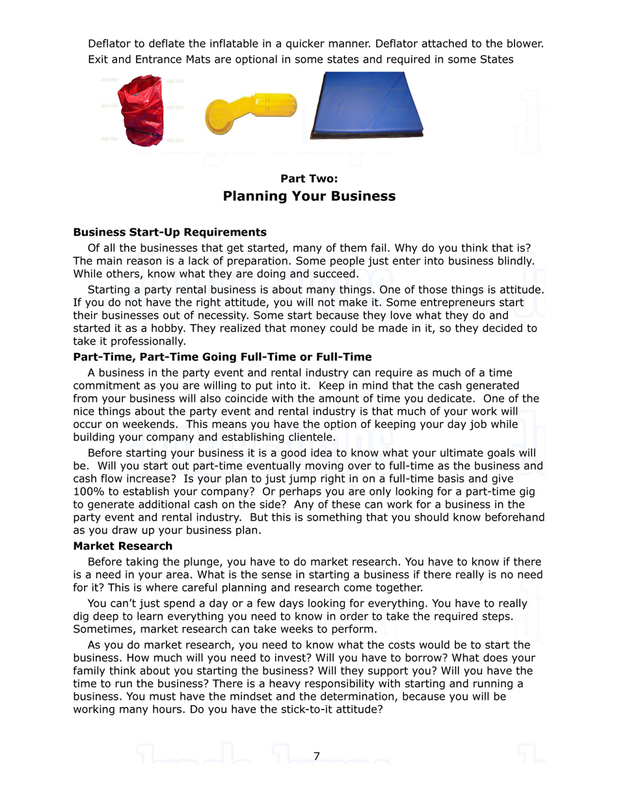 Do you have what it takes to run a business? Are you a person who has the drive to do the job even when things get touch? Can you stick it out and continue to work your business, even if business is slow? One good way to know what it takes to run a business is to talk to others who started a business and run it on a daily basis. Talk to the owner and ask questions. Let the owner know that you are considering starting your own party rental business and you want to know what is involved and what it takes to get it going. As long as you are not starting a business that coincides with theirs, they will be cooperative. When asking questions, find out what worked and what failed. Ask an entrepreneur who actually failed and find out why he/she failed. The more you ask the more you will know. Another great way to learn about the industry is to attend business owners’ workshops. Find out if there are any seminars or workshops in your area that teach entrepreneurs how to start businesses. If there is one in your area, attend it. Most are free just to get you in the door. If there is one that charges, see if it fits your budget. A great resource for this type of workshop is SCORE. You can find a local or online workshop at http://www.score.org/online_workshops.html. When looking at yourself, evaluate how you act. Are you good with people? Do you treat others with respect? Are you friendly with others? Are you willing to work hard each day you are at work? Are you well-organized? Do you have enough common sense to make the right decisions when one is needed?Most small business owners wear different hats. Are you capable of doing everything? If you know nothing about accounting or bookkeeping, perhaps you will need to hire someone. Do you have goals in mind? Most business owners succeed because they have short-term and long-term goals in mind and this guides them. Take time to write down your goals. This way you will have a guide to follow. When writing down your goals, be realistic. Don’t write down something that will be completely out of your realm to reach. The reason for this is because if you fail to reach it, you will feel bad and think that you can’t reach goals and you’ll give up.